Australia’s population growth is being felt in our cities, but are we adequately prepared for the future of high-density living? Higher density urban living has become a primary concern for urban planners, who grapple with issues such as infrastructure development, traffic management and housing solutions. But beyond these physical concerns, there are a number of very real human issues that also need to be addressed by planners as well as developers and architects. For all of its benefits, city living isolates people from the natural world, and new research is finding that this isolation affects the wellbeing of urbanites. With some clever design thinking, however, we can create cities that are more sustainable and offer a higher quality of life. As cities grow, it’s easy for green spaces to become an afterthought in the planning process. This is not just the case in public spaces, but also in the development of residential and commercial projects. Many city councils now have limited regulations in place specifying how much green space a new building should deliver, but going above and beyond this will have a positive impact on the environment, wellbeing of residents, the liveability of the property and its resale value. In the last week alone there has been a great deal of public discussion over the design of apartment buildings in Brisbane, after research by Associate Professor Rosemary Kennedy from QUT's Design Lab found that many new developments are too hot for the city’s sub-tropical climate. Due to the excessive heat generated from their glass facades, these building require a higher amount of air-conditioning for temperature regulation. “One of my major concerns is that we're not designing our buildings using good design; we're using electricity to solve design problems,” she said in an interview with ABC News. She believes that as buyers become aware of these design issues, resale prices will suffer and tenant turnover rates will increase. Building our cities without any regard for climate regulation contributes to the urban heat island effect, which negatively impacts the liveability of a city. This effect occurs when building materials such as concrete, glass and bitumen absorb and hold on to heat and, as a result, increase the temperature of a city. By incorporating plants into buildings through rooftop gardens or green walls, however, we can begin to offset this effect and cool the structure, in turn reducing the need for air-conditioning. 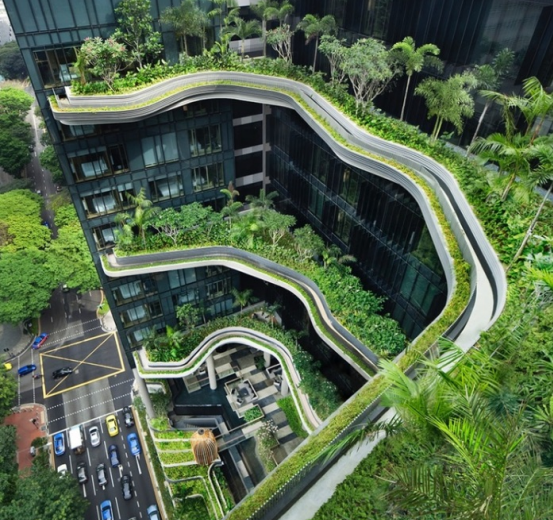 Parkroyal on Pickering, SingaporeIf we were to create enough green spaces to cool Australia’s cities by eight degrees, it is estimated that the reduced use of air-conditioning alone will lower carbon emissions by 12–15 percent each year. Integrating plants into city buildings is also an effective way to absorb stormwater runoff and reduce the noise levels experienced within office and apartment buildings. These benefits are in addition to the well-known role trees play in filtering the air by soaking pollutants. So what seems like a simple element of city design can have a big impact on sustainable living and the practicality of a building. It’s not just the environment that benefits from the practice of biophilic design – human health and mental wellbeing improves too. A recent 2009 Dutch study found that those who live less than 1km from green space had lower incidence of 15 diseases including depression, heart disease, diabetes and asthma. Here at home, 83 percent of Australians relate relaxation and time out with green spaces, and 73 percent see their garden as a place to improve their mental wellbeing. It is believed that this inherently positive association with nature lowers stress and anxiety levels, contributing to improved mental and physical wellbeing. Given this association, buyers are willing to pay more for a feeling of connection with nature. 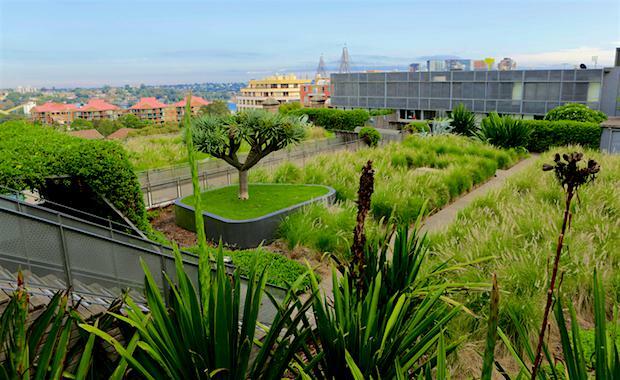 Developments such as One Central Park (pictured below) and M Central (pictured above) in Sydney showcase what is possible when a green mindset is applied to property development. 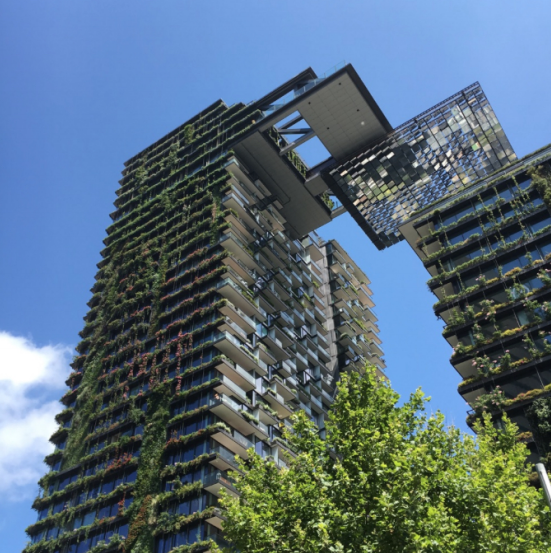 One Central Park, SydneyNot only do these buildings address sustainability concerns, they also provide greater amenity for residents and elevate the visual appeal of their respective neighbourhoods. So as we start to consider how to best deliver high density living in Australia, will buildings like these continue to be isolated case studies or will they become the norm? Carolynn Brooks is the co-founder of The Small Garden, a Brisbane-based design practice that specialises in creating green urban spaces that connect people with nature. With a belief that green spaces are essential for happiness, wellbeing and the health of our cities, The Small Garden shares their passion with the world through an Instagram account that boasts over 20,000 followers.